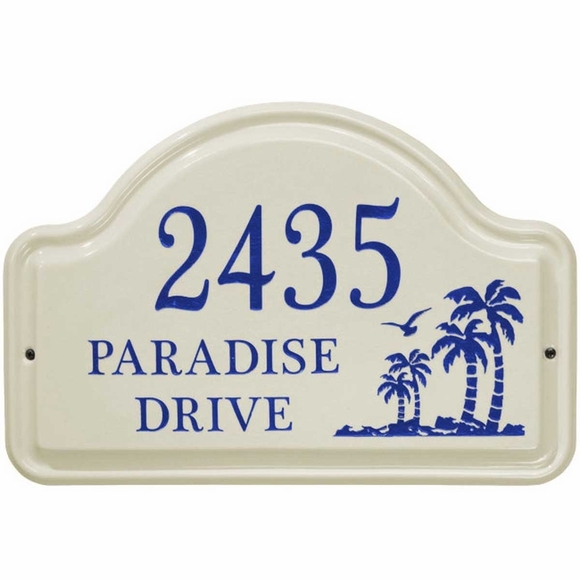 Ceramic Address Plaque with Palm Trees - - includes three lines of personalization. High-fired vitrified ceramic withstands outdoor elements. Wall mount. Made in USA. Includes three lines of personalization and palm tree accents. Line 2 holds up to eight 1" characters. Line 3 holds up to six 1" characters. Bristol cream background with dark blue, green, sea blue, or coral address and image. Ceramic plaque with palm tree theme is perfect for southern locations and vacation retreats.